Statsbot is a Business Intelligence assistant, allowing 1-click analytics. It allows users to stay on top of their data, get analytical insights and make data-driven decisions. Statsbot’s key features include 1) Insights, which allows users to create custom reports and request complex metrics, visualizing categorical data about customers. With Insights, you can identify factors that impact engagement and revenue. 2) Predictions. Statsbot builds smart predictions learning from company data. Know how activities correlate to goals and get immediate notifications to adapt quickly. 3) Smart Alerts. Statsbot can send automated reports and smart alerts about spikes in certain metrics. For example, when a number of users suddenly goes up or down users can receive reports to help decipher the reasons behind the activity. Statsbot also includes a comprehensive dashboard. The most critical reports and comprehensive view of business activities − in one place. Unite every department across an organization around data. The analyst or executive simply chooses the most important metrics and they are instantly added to Dashboard where everyone on the team can view it. By setting precise and clear goals, the whole team will have a clear plan guiding company activities. 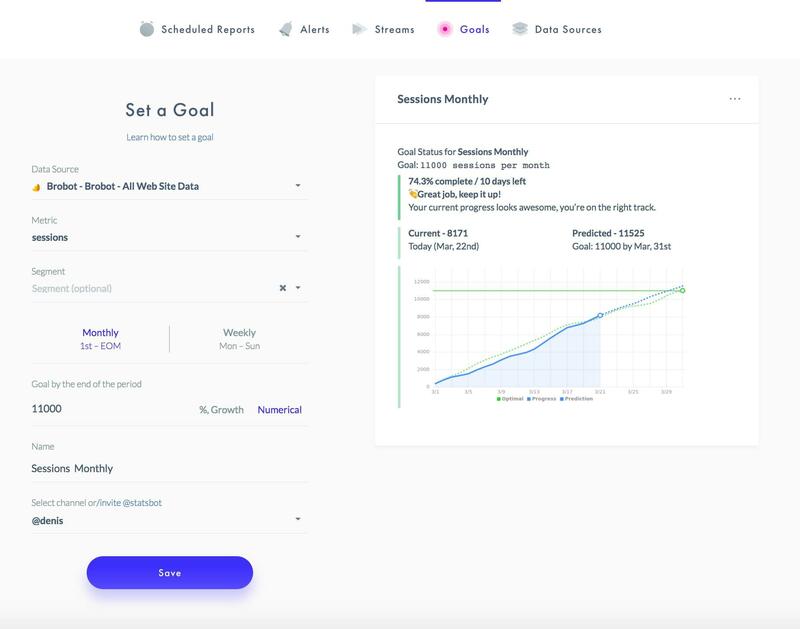 By tracking progress in real time, users will immediately know how their activities correlate to their goals, and will be able to adapt quickly. Statsbot helps save money and time, increase efficiency, optimize work teams, and stimulated business growth. Schedule reports to check metrics on a regular basis. Have real time metrics every morning. Share metrics fast. Share data insights with the whole team, partners, or investors right in a work chat on any device. Statsbot has integrations with Google Analytics, Stripe, SQL, Salesforce, Mixpanel, and other analytical platforms. Still not sure Statsbot is right for you? Use our Product Selection Tool to compare other Business Intelligence software solutions. Have questions? Call one of our unbiased Technology Advisors for a free consultation. Learn everything you need to know about Statsbot. Our experts will reach out to you shortly.